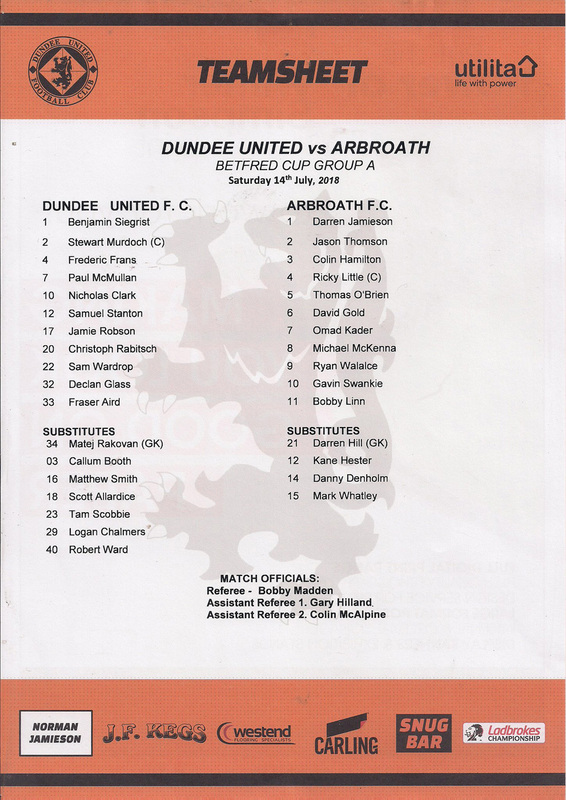 This was the first meeting between the teams since a Forfarshire Cup tie in July 1983, although the clubs did meet at Gayfield in the group stages of the Betfred Cup two years previously. 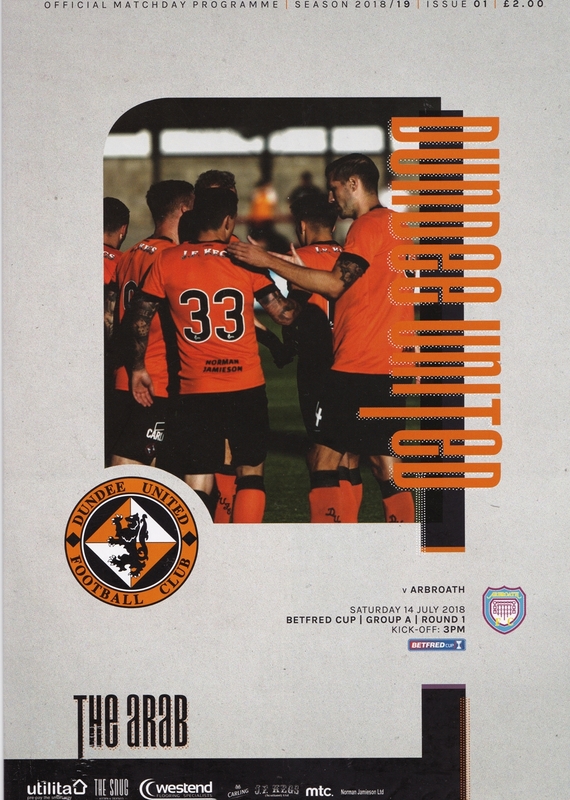 United did make a bright start to the game, but the season got off to an inauspicious start as United conceded a penalty in the first five minutes, although it was a harsh decision as Arbroath midfielder David Gold went down in the box under pressure from Declan Glass. Despite there appearing to be minimal contact, referee Bobby Madden pointed to the spot. The Red Lichties were unable to capitalise on their good fortune, however, as Ryan Wallace dragged his penalty wide of Ben Siegrist’s right hand post. 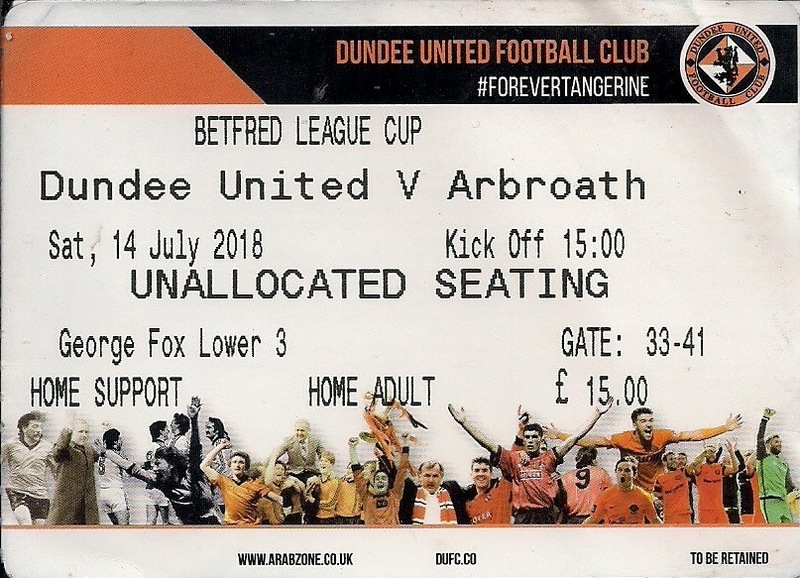 United took a while to get going in the game, although they did have an opportunity in the eighth minute when Paul McMullan broke down the right and hit a threatening ball across the face of goal that Arbroath defender Ricky Little was able to clear. A couple of minutes later, Declan Glass cut inside and hit a shot from 20 yards that was easily dealt with by Darren Jamieson in the Arbroath goal. In the 12 minutes Ryan Wallace nearly made amends for his penalty miss as he broke down the Arbroath right. He outpaced Frederick Frans as he bore down on goal, but his angled drive went just wide. Bobby Linn them shot over the bar after being played in by a short corner, and arguably should have done much better with the opportunity. Almost immediately afterwards, Paul McMullan again played a great ball into the Arbroath box, but as before there were no takers. 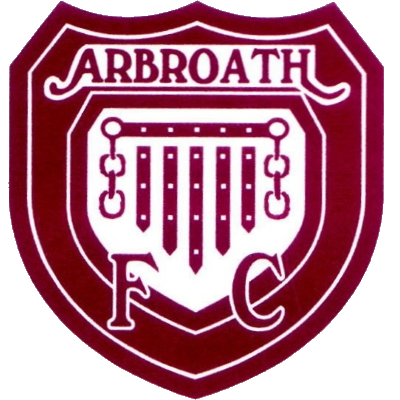 Arbroath had a second penalty claim after 20 minutes after a Sam Stanton tackle on David Gold, but although it looked a more compelling case for a penalty than their first award, Bobby Madden waved away their protests. A minute later, United created their best chance of the game thus far after some fine work by Declan Glass, who was proving to be United’s best player on the day. He fed Jamie Robson who crossed the ball into the box where Paul McMullan met the ball with a volley which went just over the bar. Arbroath were more than matching their opponents at this stage and created a couple of chances of their own before half time. A dangerous cross from Michael McKenna brought Arbroath a corner, and from that Jason Thomson headed the ball just wide. Thomson had a dangerous cross of his own a few minutes later, from which David Gold attempted an ambitious overhead kick but he sliced the ball well wide. The home side increased the tempo after half time and finally began to dominate proceedings. Declan Glass had a shot deflected wide from 16 yards after two minutes of the half, and a minute later a Nicky Clark cross from the right was headed wide by Frederick Frans. Within a couple of minutes, Glass had unleashed another low shot which Darren Jamieson was able to gather at the second attempt, before Fraser Aird fired the ball over from the edge of the box. In almost a carbon copy two minutes later, Aird had another go from slightly further out, but again the ball went just over the bar. Ten minutes into the half, an Aird corner was headed straight intro the arms of Jamieson by Stewart Murdoch, before Aird had yet another effort from just outside the box which again sailed over the bar. The home side continued to apply the pressure, although after the flurry of the first 15 minutes of the half the chances began to dry up as the players began to feel the effect of the hot conditions in what was the first competitive game of the season for both teams. The Arbroath defence was coping well with all the United pressure and were able to create a chance of their own with twenty minutes to go when a foul by Sam Stanton on Gavin Swankie resulted in a 25-yard free kick from Bobby Linn which he curled just over the crossbar. Arbroath had another chance on the break two minutes later when Michael McKenna was sent through on goal, but his shot from the edge of the area was weak and Ben Siegrist was able to save easily. United finally took the lead with thirteen minutes to go when Nicky Clark met a cross from the right from Fraser Aird and guided the ball into the net past Darren Jamieson. Despite suspicions of offside, and the protests of the Arbroath players, the goal was allowed to stand and Clark had his first United goal after his summer move from Dunfermline Athletic. To their credit, the Arbroath players did not let their heads go down after that goal and they pushed for an equaliser. Late substitute Kane Hester was put through on goal and was able to beat Ben Siegrist to the ball, but as the players collided Hester was unable to divert the ball into the net as he lay on the ground. The ball broke to Michael McKenna who had a shot charged down. United failed to fully clear the danger and the ball was knocked out for a corner kick. From that corner, as the ball bounced in the penalty area Christoph Rabitsch caught Hester, and Arbroath were awarded their second penalty of the game. This time they were able to take advantage as Bobby Linn calmly slotted the ball past Siegrist to level the scores with eight minutes to go. It could have got worse for United in stoppage time as Kane Hester looked to be taken out by Ben Siegrist, but this time no penalty was forthcoming and the match ended level. The draw ensured that both teams would pick up at least one point from the game, but a penalty shot out was required to determine which side would get the available bonus point, as it had in the previous meeting between the teams in 2016. Both sides scored their first three penalties with Michael McKenna, Mark Whatley and Ryan Wallace all successful for Arbroath with Stewart Murdoch, Fraser Aird and Paul McMullan all scoring for United. Ricky Little made it 4-3 to the visitors by crashing his penalty in off the crossbar, before United youngster and late substitute Logan Chalmers saw his spot kick saved brilliantly by Darren Jamieson. It was left to Bobby Linn to score his second penalty of the day to seal a spot kick win for Arbroath and give them the bonus point. Welcome back to Tannadice after a hectic summer which has seen many changes in the playing and backroom staff. Our aims in the Betfred Cup are two-fold. First and foremost, we are looking to qualify for the knock-out stages because that is Important for everyone connected with the Club. Additionally, these games will help us prepare for the start of the Championship next month. It gives us an opportunity to find the right balance which we will need for the challenges which lie ahead in the league. Whilst I have been happy enough with our pre-season so far, the team still requires fine tuning and there will be some changes with further recruitment. Time is tight and we have to make quick decisions on what these will be, but we have to make good decisions. I hope there might be one new arrival before we get the season underway this afternoon. Like you the fans. last season was disappointing, but I can assure you that everyone in the dressing room and management shared that disappointment. Hopefully, all the changes we have made over the summer will enable us to deliver the results we all want. Certainly our aim is to do everything better and we hope that you will all get behind the team to help make this happen, starting with today's match with Arbroath.